UPDATE (3/19/2013): I have updated the tables and figures below to incorporate the newly available GSS 2012 data here. I posted previously about those who identify as religious but not spiritual. I'm expanding this into a bigger project, and I'm going to present some of the findings here on the blog as I work. 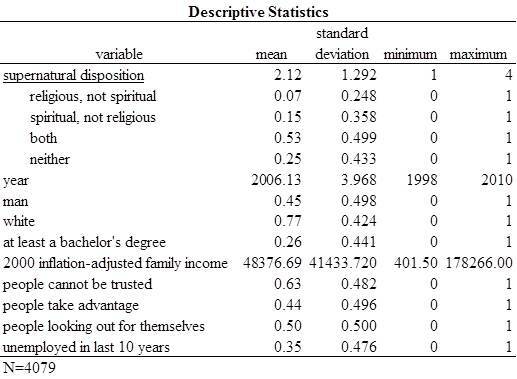 I begin by constructing a dependent variable for "supernatural disposition" from the GSS variables that ask "To what extent do you consider yourself a religious person?" [RELPERSN] and "To what extent do you consider yourself a spiritual person?" [SPRTPRSN].